This list includes a selection of high, powerful, unusual and very beautiful waterfalls from around the world. Dettifoss – Iceland, Norðurland eystra. This is often considered to be the most powerful waterfall in Europe, although at flood time the Rhine Falls (Switzerland) might be more powerful. It is 44 meters high and around 100 meters wide. Gaping Ghyll – United Kingdom, England, Yorkshire. The Fell Beck stream falls directly into Britain’s largest cavern and is 105 – 110 meters high. 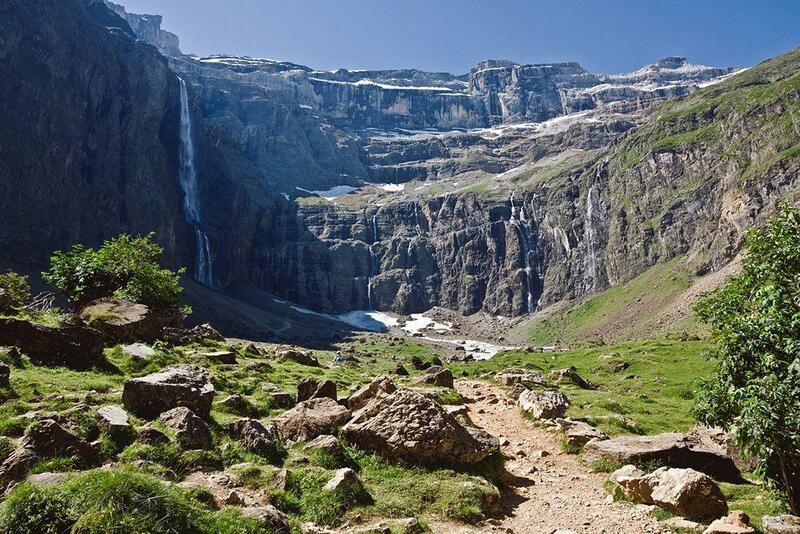 Grande Cascade de Gavarnie – France, Hautes-Pyrenees. 422 meters high, impressive falls. Its highest single drop is 281 meters. It is located in the impressive setting of an enormous glacial cirque. Gullfoss – Iceland, Suðurland. A beautiful, wide waterfall with two tiers placed at 90 degrees, with a total height of around 32 meters. Hraunfossar – Iceland, Vesturland. A very unusual, 900 meters wide waterfall, emerging from under a lava field and falling directly into the Hvítá river. Langfoss – Norway, Hordaland. A powerful, large river that cascades down a steep but not vertical, cliff with a height of 612 meters. Sotefossen – Norway, Hordaland. A waterfall of unusual beauty, with two steeply sliding tiers and a total height of 246 meters. Vrtiglavica waterfall – Slovenia, Slovenian Littoral. Approximately 400 – 440 m tall waterfall inside 643 m deep cave. Possibly the tallest underground waterfall in the world. 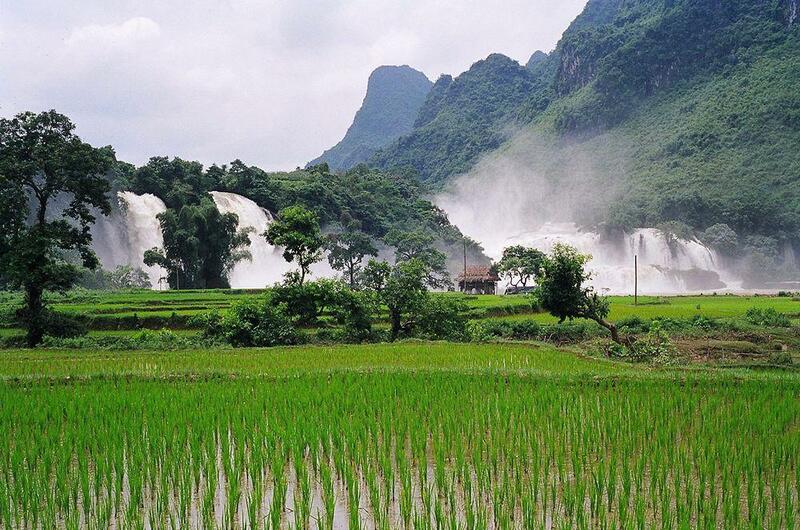 Detian Falls and Bản Giốc Falls – China, Guangxi and Vietnam, Cao Bang province. One of the most picturesque waterfalls, it is around 60 meters high and 200 meters wide. Hidden Falls – Tibet, Nyingchi, Tsangpo Gorge. 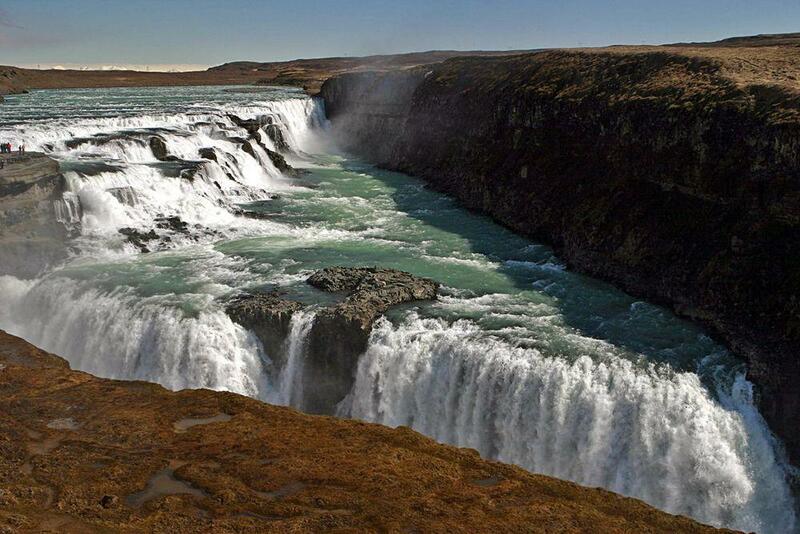 This very powerful fall is around 30 metres high and is located in one of the last explored areas on Earth. It was discovered only in the late 1990s. Upstreams are located Rainbow Falls, which are some 20 m high. Khone Falls (Chutes de Khone) – Laos, Mekong river, Ban Hang Khone. At 10783 metres, this is the widest waterfall in world. The total height of the cascade is 21 metres. Nohkalikai Falls – India, Meghalaya. This is a beautiful 335 meters high plunge over a giant, overhanging cliff, almost directly into a lake. Augrabies Falls – South Africa, Cape of Good Hope province. The Orange River falls 56 meters into a deep gorge. During a flood, this becomes one of the most powerful falls in world. Cascades de Trou de Fer – Réunion Island, Cirque de Salazie. 725 metres tall falls of Bras de Caverne stream in an impossible, dramatic location: one of the deepest and steepest canyons in the world. Inga Falls – Congo DR, Bas-Congo. These are some of the largest and most impressive rapids in world, on the Congo, one of the largest rivers of the world. They drop 96 meters over the course of 15 kilometers and form a part of Livingstone Falls (Chutes de Livingstone) consisting of 32 rapids over the distance of 340 km, with a total drop of 260 m.
Jinbar Falls (Jinbar Falls) – Ethiopia, Amhara. Jin Bahir stream falls into a giant, 800 m deep abyss in Simien Mountains. Falls are starting from deep canyon – thus their height is less than the depth of abyss but nevertheless – more than 500 m.
Kalandula Falls – Angola, Malanje. 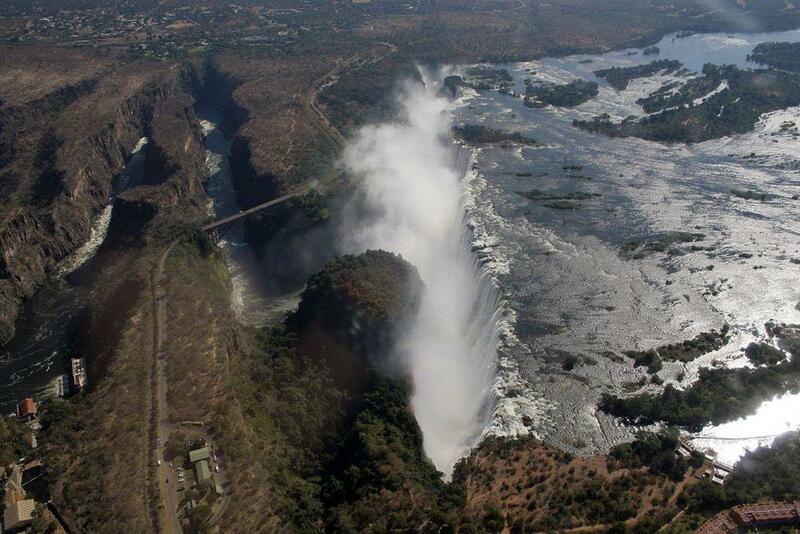 Falls of unusual beauty, up to 105 m tall and 410 m wide, some of the most powerful falls in Africa. Tugela Falls – South Africa, KwaZulu-Natal. The second tallest waterfall in the world. Total height of 948 meters and the largest single drop of 411 meters, and a river width of 3-15 meters. Victoria Falls – Zimbabwe, Matabeleland and Zambia, Southern State. World’s largest curtain of falling water, 1,708 meters wide and 108 meters high waterfall. One of the most impressive natural sights in world. Francis Falls – Canada, British Columbia. A powerful, approximately 650 metre high waterfall, belonging to a larger group of very impressive waterfalls. Hidden Valley Falls – Belize, Cayo. More than 450 meters high, this waterfall is in a unique location. In the upper reaches of the waterfall there is a unique growth of fir, while down below there is a tropical jungle. Horsetail Fall in Yosemite Valley – United States, California. Very tall, seasonal waterfall which in the late February, if weather allows, is illuminated by the sunset. Waterfall is 650 m tall, tallest cascade – 480 m tall. Hunlen Falls – Canada, British Columbia. A very picturesque and impressive waterfall, which leaves the lake in a 26 meters wide stream and plunges 374 meters into a deep canyon. 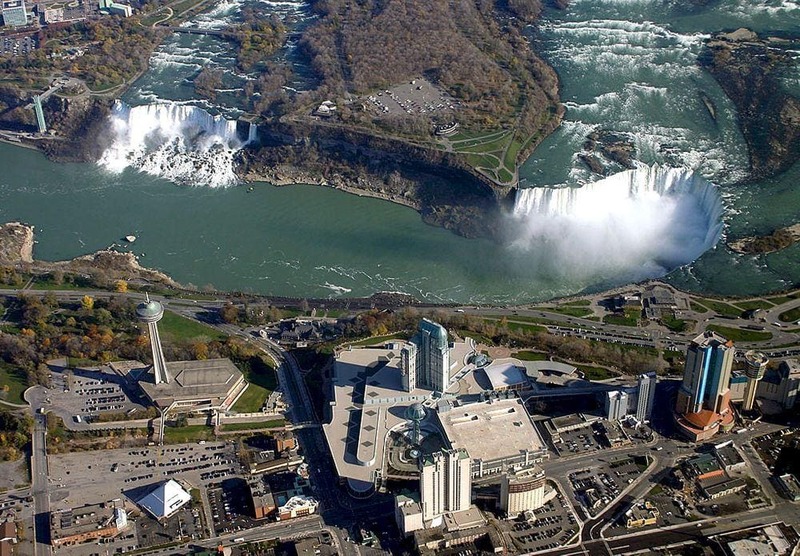 Niagara Falls – United States, New York and Canada, Ontario. The most popular waterfall in world is 51 meters high and 1203 meters wide. The shape of the waterfall and its proportions have become somewhat synonymous with the word "waterfall". Schwarzenbach Falls – Canada, Nunavut, Baffin Island. These 520 meters tall falls (tallest single drop – around 200 meters) are special due to their location: they are possibly the most remote and the most northern large falls in world. Takakkaw Falls – Canada, British Columbia. These are very beautiful falls with a total height of 380 meters and the highest drop at 260 meters. Yosemite Falls – United States, California. These falls are 739 meters high, have 7 drops and are some 28 meters wide. One of the most visited waterfalls in world. Angel Falls (Salto Angel) – Venezuela, Bolivar. This is the tallest and one of most spectacular waterfalls in world, with a total height of 979 meters. It has the highest single drop (807 meters) in the world. Aponguao Falls (Salto Aponguao) – Venezuela, Bolivar. Very impressive, powerful waterfall, 106 meters high and approximately 200 meters wide. Eldorado Falls (Aracá Falls) – Brazil, Amazonas. A powerful, 353 m tall fall with a single plunge. Discovered recently, around 2000 AD. Iguazu Falls (Salto de Iguaçu)- Argentina, Misiones and Brazil, Paraná. One of the most enormous and most impressive waterfalls of the world, they are "only" 82 meters tall, but 2 700 meters wide. Gocta Falls (Catarata Gocta) – Peru, Amazonas. A very high waterfall with a measured height of 771 meters. Waterfall has two drops, the tallest one is 540 m tall. Kaieteur Falls – Guyana, Mazaruni-Potaro. A very powerful waterfall in a wonderful jungle setting, it is 226 meters tall and 113 meters wide. Kukenaam Falls (Cuquenan Falls) – Venezuela, Bolivar. With 674 meters in height and 61 meters in width plunging from the rim of a tepui, this fall is similar in many respects to the highest falls in world – Angel Falls. Kumerau Falls (Kumarau Falls) – Guyana, Cuyuni-Mazaruni. 190 m high and 60 m wide plunge, one of the most impressive waterfalls in country. Pará Falls (Salto Pará) – Venezuela, Bolivar. The widest waterfall in South America, it is 5.6 kilometers wide and 64 metres high. Roraima Falls (Salto Roraima) – Venezuela, Bolivar. 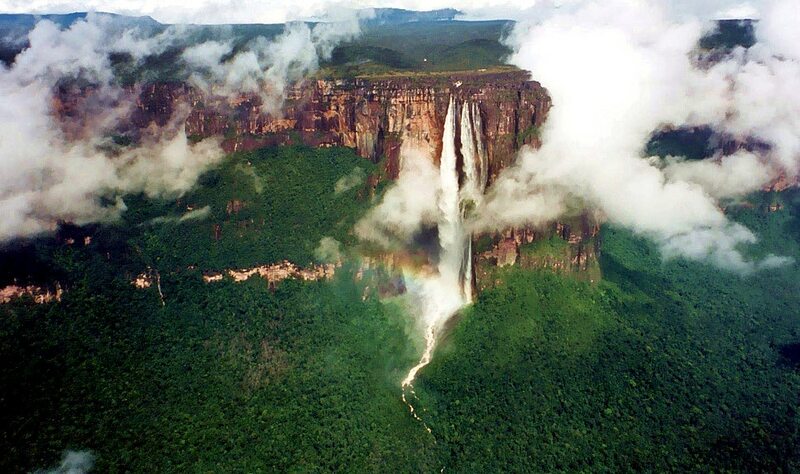 This waterfall is 610 metres high and 23 metres wide, falling from the high wall of a tepui. Oshi Falls – Guyana, Cuyuni-Mazaruni. Powerful and visually impressive waterfall, 214 meters in height and around 30 meters in width. Tres Hermanas Falls (Cataratas las Tres Hermanas) – Peru, Ayacucho. This 12 meters wide stream has a total height of 914 meters in 5 drops. Ventisquero Colgante Falls – Chile, Aisén. One of the highest waterfalls in Chile and possibly – one of the most beautiful waterfalls worldwide. Water originates from the base of Ventisquero Colgante glacier and falls more than 350 m high in a single plunge as approximately 30 m wide stream. This is rare sight, as above this giant waterfall is towering a wall of blue glacier. Several smaller falls around are even higher. Olo’upena Falls – United States, Hawaii, Moloka’i. 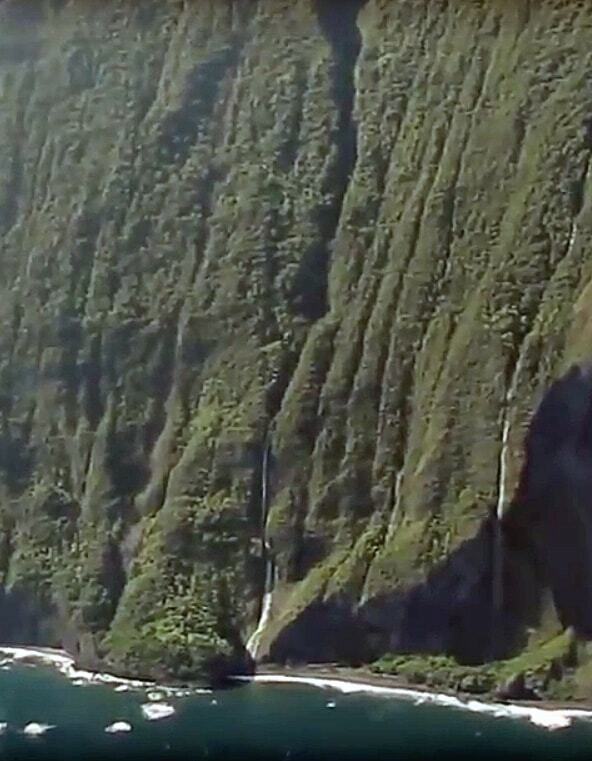 At 900 meters in height, this is an amazing seasonal waterfall falling directly into ocean. Sutherland Falls – New Zealand, Southland. This beautiful 580 meters high waterfall starts directly from the glacier-fed Lake Quill and falls in three drops. Vaipo Falls (Falls in Kings Valley, Haka Falls, Ahuii Falls) – French Polynesia, Marquesas Islands, Nuku Hiva, Hakaui Valley. Approximately 350 m tall waterfall in dramatic, impressive valley. Waterfalls and rapids or sections of rivers with steep beds have diverse origins. Many waterfalls, including the most powerful waterfalls of the world, are shaped by the stream itself. The power of the flowing water at a fault line or trench, gradually erodes the riverbed. Slowly, year by year it is carved deeper. As the threshold of the plunge recedes, it leaves behind a ravine. If the conditions are right, the waterfall will, over the time, become higher and higher. Beautiful examples of such waterfalls are Victoria Falls (Zambia and Zimbabwe), Iguazu Falls (Argentina and Brazil), Niagara Falls (straddling the border between Canada and the United States). The highest waterfalls of world fall down along natural slopes, which are either shaped by tectonic processes or, for example by glaciers but not by the stream itself. In many cases the slope is more or less oblique, i.e. not vertical or overhanging. Then the water is pouring down along the cliff. If such falls (rather, flows) are consequently measured, the Hymalayas or the Andeas could easily have the highest waterfalls in world. But in general, such steep flows are not considered to be true waterfalls. When the most impressive oblique falls with larger and smaller plunges in between, are measured, they often belong to the highest falls in world. Many of the most impressive waterfalls of the world are located in glacier shaped mountains, especially at the ends of hanging valleys: such waterfalls are located in Norway, Alps, British Columbia (Canada), New Zealand and elsewhere. Such waterfalls often have very high plunges or uninterrupted falls of water. 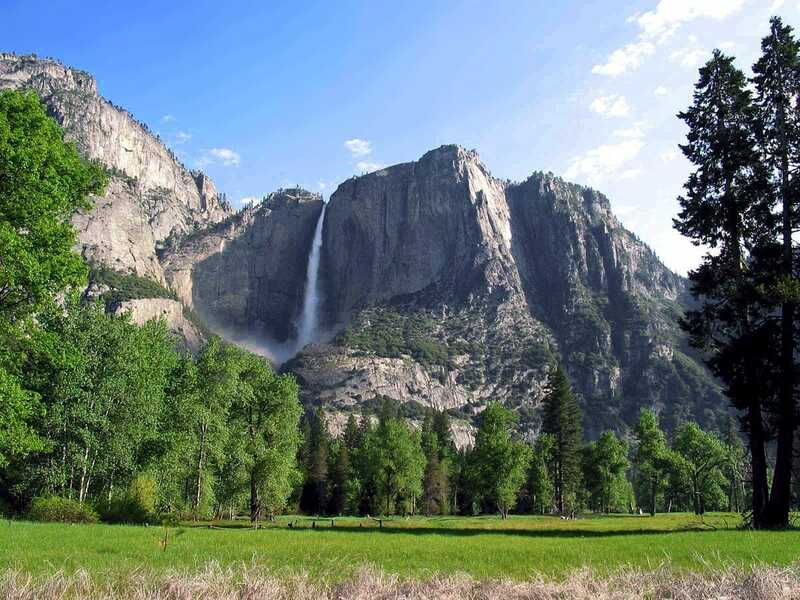 For example, the tallest plunge of Yosemite Falls (California, United States) is 436 meters tall. In the Guiana Highlands (South America) there are outstanding natural formations, the tepuis or table-top mountains, with extremely high abrupt sides. 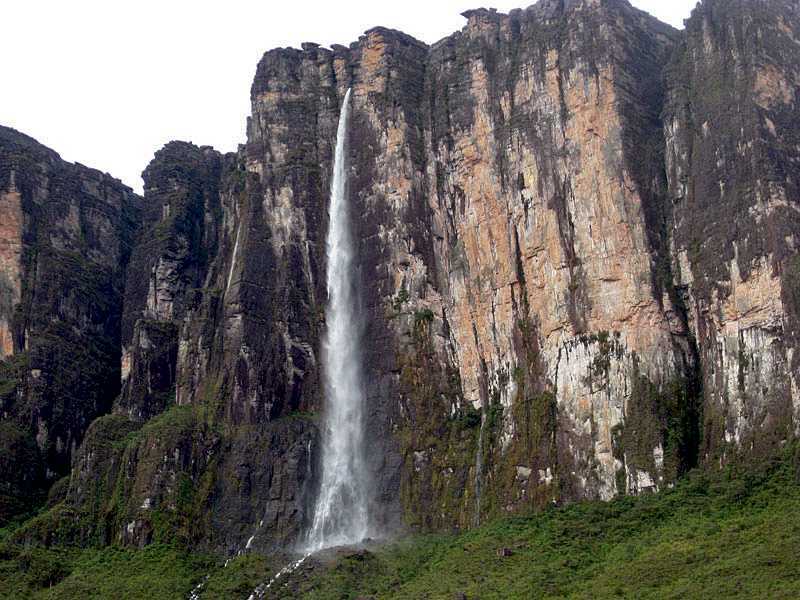 Here one can find the highest waterfall of the world the Angel Falls (Venezuela) which are 979 meters high. A major part of its height, 807 meters, constitutes one fantastic drop. In this area there are several more of the highest free-falling falls of the world, such as Roraima Falls (610 m) and Kukenaam Falls (674 m), both of which are in Venezuela. Waterfalls and rapids are any sections of rivers where the elevation is changing more or less abruptly. This allows for wide interpretations. Sometimes there are attempts to represent 10 kilometres long rapids as a single waterfall. The minimum size of a waterfall (especially – height) is subject to the local traditions of each separate country. 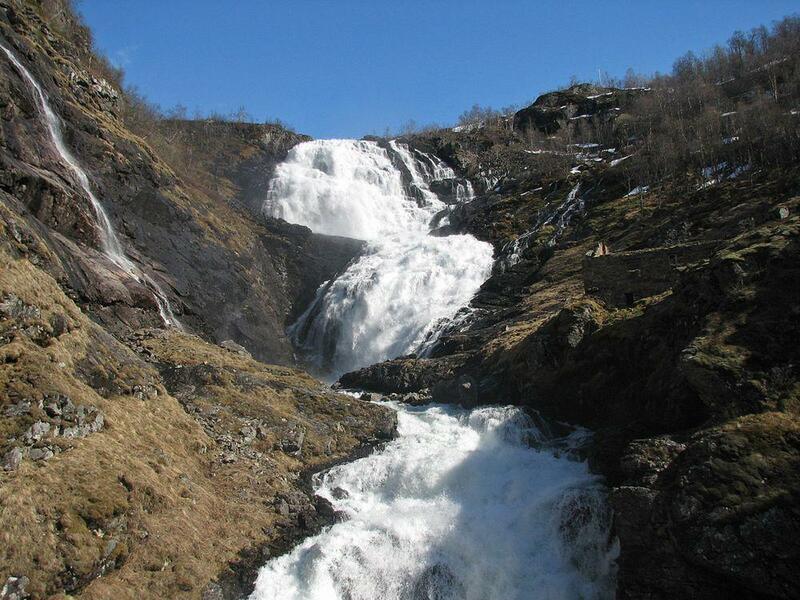 A 2 metre high waterfall is considered to be an attractive curiosity in lowland countries, while, for example, in Norway such falls in general are not much noticed. This website includes outstanding waterfalls and rapids of the world: each of them well exceeds the minimum requirements of a true waterfall. No single waterfall is the largest waterfall in the world, because no waterfall is greater in all dimensions at once. The highest falls in the world are the Angel Falls in Bolivar, Venezuela. 979 meters high, their tallest single drop is 807 meters. The widest falls in the world are the Khone Falls in Ban Hang Khone, Laos, where the Mekong River becomes 10.8 kilometers wide. Some data even gives a width of 14 kilometers to these falls. 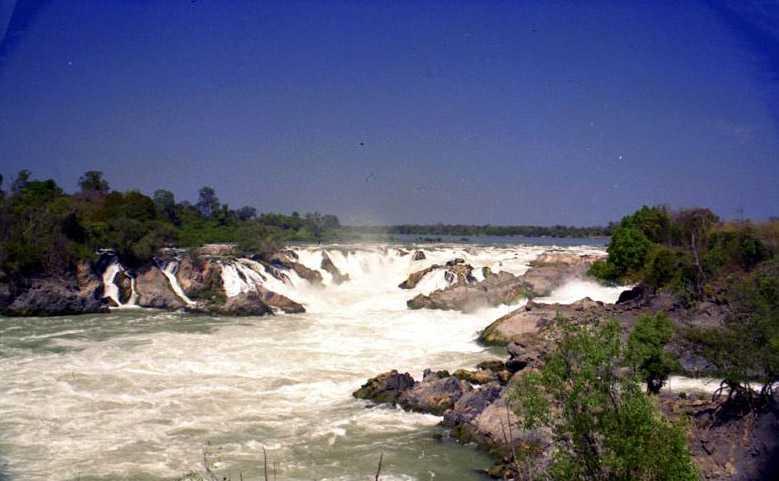 The most powerful falls in the world are most likely the Inga Falls in Bas-Congo, Congo, but these are actually rapids. Before reaching its mouth the enormous Congo River leaps over 32 large rapids – Livingstone Falls and the largest ones of these are Inga Falls. River near these falls exceeds depth of 230 m.
The largest curtain of falling water is created by Victoria Falls in Zambia/ Zimbabwe. The falls are 80 – 108 meters high and approximately 1708 – 1737 meters wide the area of the water curtain covering up to 55 ha. 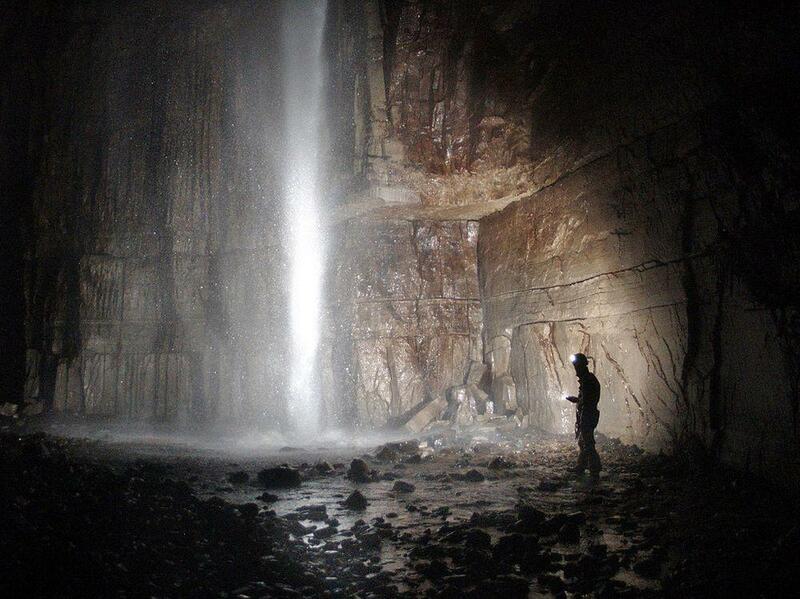 Very tall underground waterfall is the Gaping Ghyll in Yorkshire, United Kingdom. This fall of Fell Beck stream is 105 – 110 meters high. But in Vrtiglavica cave (Slovenian Littoral, Slovenia) is approximately 400 – 440 m tall waterfall! An examination of waterfalls and rapids, and how they shape the earth. There are photographs capturing the dramatic forces of nature and the text is non-scientific and filled with facts. While waterfalls have often been considered in terms of their picturesque qualities, their rich cultural background has been neglected. In Waterfall, Brian Hudson portrays these marvels in a new light. He explores the many myths and legends waterfalls have inspired in cultures ranging from Native American to Celtic and Indian, and how they have been depicted in art, literature, film, and music.